Newall: Off-duty cop ran over Danny Dimitri. Was there drag racing? It has been nearly two months since Danny Dimitri was killed in a school zone by an off-duty officer who sped down Cottman Avenue. The cop wasn't heading anyplace special. He'd just left the gym. Philadelphia police are investigating whether he was racing a workout buddy, another off-duty cop. There is video footage of the incident. Horrible footage. There's the image of Danny's limp body crumpled against a telephone pole, and there's the shot of the cop pacing toward the body, glancing down, then turning away. 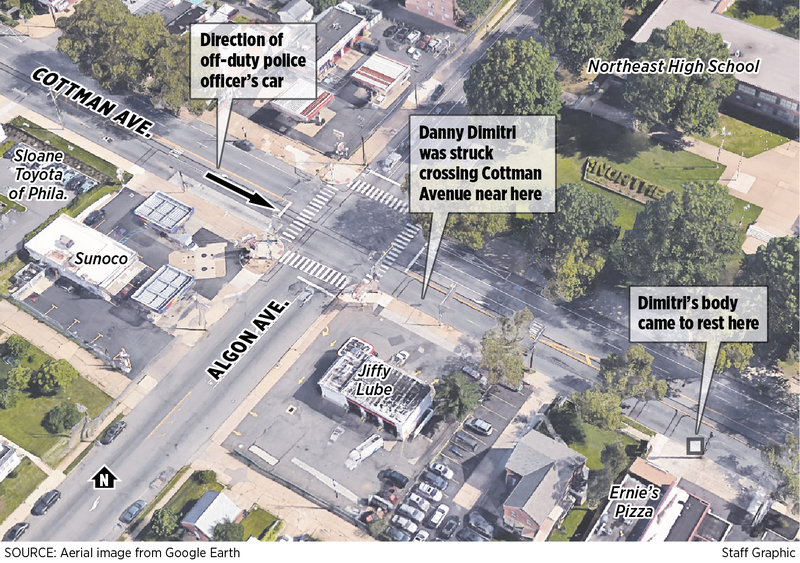 Photo Gallery: Newall: Off-duty cop ran over Danny Dimitri. Was there drag racing? You see it – and you wonder: Why has no one been arrested? It was 11:30 a.m., and Danny, who was 50, was crossing at Cottman and Algon, outside Northeast High School. He was heading to Chuck's Albi, a seafood restaurant at Oxford Avenue, where he worked as a chef. On this January morning, he was walking to the bus to collect his paycheck. The cop said Danny darted out. Witnesses told me Danny simply had no time to get out of the way. The silver Subaru sports car struck Danny with such force that his body flew as high as the street's electrical wires, witnesses said. The impact ripped his clothing away, down to his underwear. Like when people are hit by trains. The officer that struck Danny, Adam Soto of the 24th Police District, has been placed on administrative duty, police confirm. A grand jury is weighing charges. There are three cops involved in the death of Danny Dimitri. There is Soto, who is 23. And there is a three-year veteran who was driving a white Mercedes. He's on desk duty too. And there's his passenger, another three-year guy from the 12th District, who has since retired from the force for unrelated reasons, said Capt. Sekou Kinebrew, a department spokesman. Kinebrew did not release the names of these officers but said investigators are working to determine whether there was racing. "That's one of our gravest concerns – if there was drag racing," Kinebrew said. Cherylann Dimitri Prosinski has been searching for answers in her younger brother's death for the last two months. She is getting some. She and her daughters, Stephanie and Brittany, met last month with Kirk Handrich, an assistant district attorney who handles homicides. Soto was traveling between 80 and 90 m.p.h., the family say they were told. That's the same speed that police sources told me. The speed limit on that street is 30 m.p.h. Investigators have been working to see how fast the second car was traveling and whether it slowed before the intersection. A spokesman for the District Attorney's Office said he could not comment on the ongoing investigation. At Cottman and Algon, witnesses wince when recalling the scene. Rob Richardson, who works inventory at the Toyota lot, was filling up a van at the Sunoco when he heard the roar of an engine. "That motor was running," he said. "The man was trying to get out of the way. But something coming at you that fast – he was like a deer in the headlights. He was stuck." Tom Konrad, owner of Ernie's Pizza, was out back when he heard a crash so loud, he had assumed two cars had collided. On the screen, Danny rolls into view, his clothes flying, his body landing against a pole. Soto comes to a stop halfway down the block. Bystanders rush to help, flagging down an EMT. The guys from Jiffy Lube do all they can. Soto turns away at the body, paces. The other off-duty cops pull up about 20 seconds later. They do not help either. Instead, the second driver keeps his hands stuffed in his pockets as he takes a look at Danny through the crowd. While others attended to the man in the street, he and the other cop comforted Soto by his car. An hour later, Danny was dead at Aria Torresdale Hospital. The Dimitris want answers. And they want people to know what happened. What makes things harder, Cherylann Dimitri told me, is that members of her family have always been very supportive of the Philadelphia police. That's why they are so baffled, because you would think – we would all think – that an officer whose job it is to police people from speeding would realize what he was doing when he flew through a school zone at God knows how fast. Or that he would have at least tried to help Danny Dimitri. Protect and serve, right? On Wednesday, Cherylann and her daughters were at Danny's apartment, packing his cooking knives, beloved bass guitar and records by Elvis, the Beatles, and the Ramones, his comic-book collection and favorite sci-fi flicks, such as Invasion of the Saucer Men and It Came From Outer Space. "I want justice for my brother," Cherylann said. "I want my mother to stop crying constantly, 'My son, my baby, my baby.' I want people to know that he was a good person."